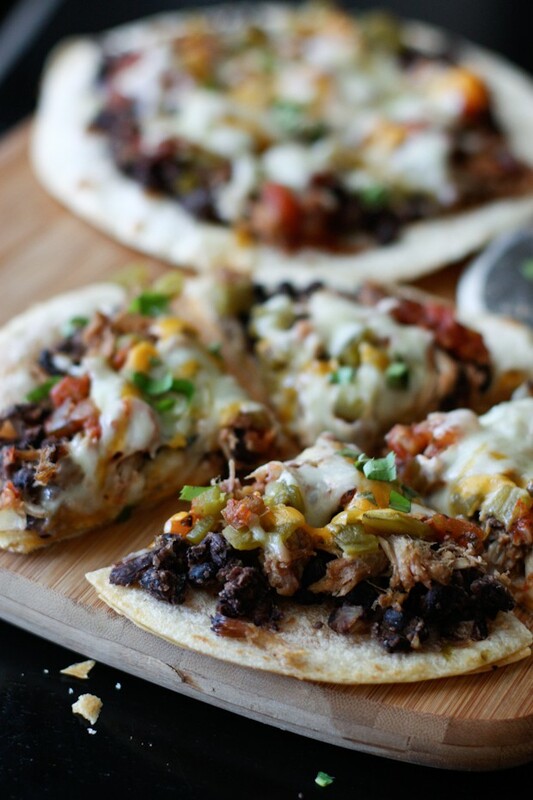 Loaded with pulled pork, beans and cheese this Mexican Black Bean Pizza will satisfy any appetite or craving! This recipe was created in partnership with Bush’ Beans. Many of you know that pizza and I go way back. Waaaaaay back. (if you didn’t know, my parents have owned a pizza shop since I was an itty bitty girl, I grew up watching my dad making a million pizzas a week). It’s hands down my favorite food in the world. Mexican food? I don’t think I had a taste of Mexican food until I was close to becoming an adult. Mexican food didn’t really make appearances in my Italian rooted house during my childhood. I think I had my first bean dip when I was waitressing at a sports bar in college. Nachos and I became best friends around that time too. I think it’s now safe to say that I love Mexican food. And I cook it at home at least once a week. This little recipe for Mexican Black Bean Pizza is the perfect combination of my two favorite foods. It uses just a few ingredients that you will most likely already have on hand. The one ingredient you may have to make a little effort for is the pulled pork. I happen to have some leftover in my freezer from the last batch I made, but if you don’t, any leftover protein would really work here – leftover grilled or pulled chicken, chorizo or taco meat. Play around with it. Of course, this little pizza included another favorite food of mine – beans. Grab a can, heat them up with some onion and throw them on there, easy peasy. 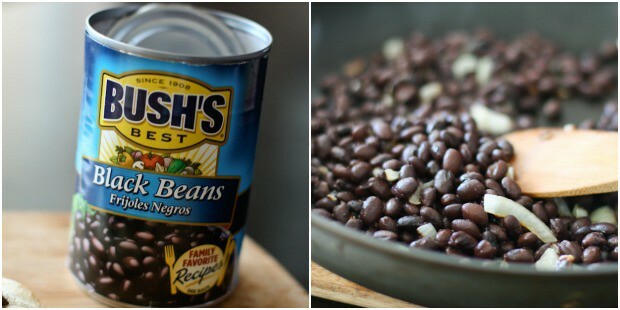 Canned beans are so great to have on hand to add to any recipe. Each pizza “crust” is made with 2 tortillas, glued together by cheese, to make it sturdier. I thought this was pretty genius. If you are watching your calories, just cut back a little on the cheese – and remember to shred it yourself straight from the block, I always find that when you do it that way the cheese melts so much better and you can use a lot less. Preheat oven to 350 degrees. Combine half of the Cheddar with all of the Monterey Jack cheese in a bowl and set aside. Brush a baking sheet with 1 tablespoon oil and arrange 4 of the tortillas in a single layer. Sprinkle the other remaining half of the cheddar cheese over each tortilla. Top with remaining 4 tortillas and bake for 4-5 minutes or until lightly browned. While tortillas are baking, heat 1 tablespoon of oil in a skillet and cook onions until soft and browned. Add beans to onions and partially mash using the back of your fork (or a potato masher). Remove tortillas from the oven and top each tortilla evenly with bean mixture. Top evenly with salsa, chiles, pulled pork and cheese blend. Put back into oven and bake for about 10-15 minutes or until cheese is melted. or check out BUSH’s Beans Recipe and Meal Ideas page for more inspiration! Mmm! This looks so good! I love black beans and obviously Bush’s is a great brand! Black bean pizza is SO GOOD! We call it taco pizza, and it’s the best. Love this recipe Aggie!! This is so brilliant! I now know what to do the next time I can’t make up my mind whether to go Italian or Mexican for dinner. Thanks for sharing this amazing recipe. Lovely recipe, Aggie! I’d love to eat a Mexican meal at your house. Thanks for the linky love, too! Happy Memorial Day! YUM! I just made this recipe last week. It was sooooo good! AND crispy! Oh Aggie, these look fantastic! And I agree – layering all of this on a quesadilla? Pure genius! How fun to grow up in a pizza place. 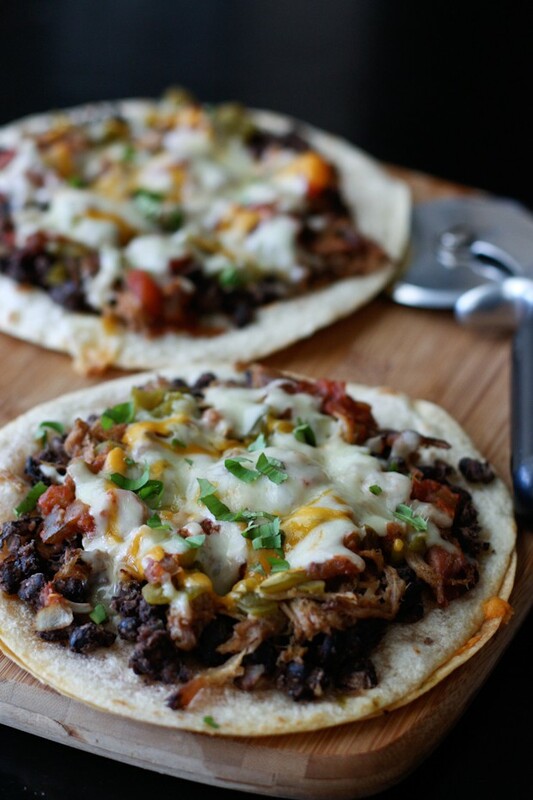 Love these Mexican pizzas, they would be wonderful for lunch. Love Mexican food! These pizzas look great! 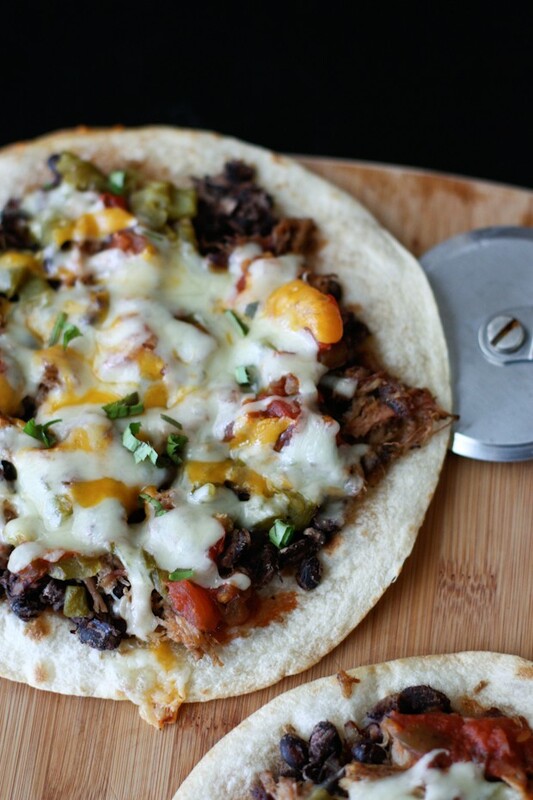 What a great idea to use the double layer of tortillas with cheese in between! And those Mexican toppings would make my family cheer with joy. I love Mexican pizza! I’m embarrassed to admit I was obsessed with the Taco Bell version as a kid. Yours looks a million times more delicious! Um, YES. This could be my meal everyday forever and I’d not bat an eye. These look awesome! I am addicted to black beans so this is just right up my alley! SERIOUSLY?? beans on pizza, i love this. Gluing the two tortillas together with cheese is BRILLIANT! 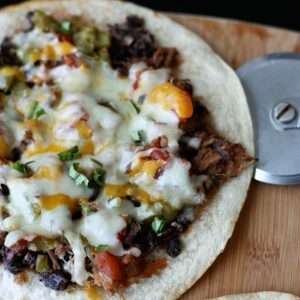 I love using tortillas as a base for quick and easy pizzas, but always felt they were too flimsy… this is a great way to add some more gooey cheese, too! Looks so delicious–and easy too! This look so fabulous and a great way to use up leftover pulled pork! That is so neat that your parents own a pizza shop! Mexican pizzas are the best! This looks delicious! You had me at black beans. Yum, these look fantastic. I use Bush’s beans in a lot of recipes. They are the best! We love black beans, I use them in so many things. This is going on my quick and easy summer lunch idea list! I’m loving this, we go through ALOT of tortillas around here. Thanks for another great recipe, Aggie! Ooh I’d love to throw back a few of these with you! Oh, I just love this idea, so good! I’m so glad you were introduced to Mexican food – I can’t imagine life without it!! Looks delicious, Aggie! I love Mexican pizzas 🙂 Great idea to stick the tortillas together with cheese as the “glue”. Love it! Yum! These look so good! I’m trying to figure out what to make myself for dinner this might just be it! Perfection. I love the dual layer tortillas here. sounds fantastic! So glad you enjoyed! And congrats on the fresh eating lifestyle change, it makes a huge difference in how you feel !! Pinned it, made it, loved it! I made my own tortillas for the first time. Can’t believe how easy and so much better tasting they are! Great recipe, thanks! Ohhh, I would really love to make my own tortillas. Did you follow a recipe? That is on my bucket list! Thanks so much for stopping by and letting me know MaryAnn! I searched on Pinterest, there are many recipes, and all have the same basic ingredients: flour, salt, baking powder, and butter flavored crisco. I just chose one that didn’t make a ton (it made 12) since I wasn’t sure how they would turn out and that had a lot of positive feedback. They were perfect for your black bean pizza! The quality is amazing compared to store bought, and mine tasted like Cafe Rio if you have ever eaten there. If you haven’t, put that on your bucket list! Amazeballs! Stumbled upon this recipe yesterday and made it last night! I am a vegetarian so I left the pork out. I didn’t have salsa so, I added a bit of cumin and these were great. My 6 year old’s only complaint was that he had to wait for his to cool. I brought leftovers for lunch today. Super easy! Super fast! Yay! This is great feedback, thank you! Personally I would prefer mine without pork as well but my husband loved the meaty version 🙂 So happy you stopped back to report – and SO happy your 6 year old enjoyed it! Thanks so much! I just happen to also have a small frozen package of my husband’s pulled pork. I am making this for dinner this weekend. I think I might even try to make my own tortillas like Mary Ann did. Thanks for the great recipe. Tried this recipe tonight at the recommendation of my sister. I loved it as did my parents. Still have to try it on my super picky son (he wasn’t home for dinner). I added it to my personal book of recipes to make again and again! I added a bit of fresh cilantro on top before serving and I’m going to try with fresh avocado slices next time! ohhh, would be amazing with avocado slices! I’m so happy to hear you tried it and enjoyed it. Maybe you can customize it for your picky eater 😉 Thanks so much for the feedback and for stopping by to comment! Have a great week!